For first time buyers keen to purchase a freehold house in the original City of Toronto, finding an affordable solid property in a decent, desirable neighbourhood is becoming increasingly difficult. The level of challenge increases if the wish list includes being on one of our main public transit arteries. Given an inevitable by-product of urban growth is vehicular gridlock, it means finding a reasonably priced property on the subway or streetcar line in proximity to the downtown core will become increasingly slim. We only have to look to larger urban centres in developed countries to know that, over time, mostly the wealthy live in the city centre. Since we started our property search, we're discovering comparable houses on the east side are typically less expensive than the west. Can you provide any insights? We really like the convenience, amenities and vibe of the east side's Leslieville or South Riverdale neighbourhoods. First, did you know that the east side of our city - since its inception - has historically housed the working class, while the west side accommodated a mix of residents, including the more affluent merchant and professional classes? Ever since cities centred on production and commerce have boomed, the most desirable locations have always been on the west side. Why? Because they're not downwind from centres of industry. In Toronto our lake breezes once blew all of the city's smoke, soot and stench over the east end (See the 1892 Map Of Toronto's Streetcar Lines at the top of this post to see all those smokestacks blowing east). From Toronto's beginnings this redirected the affluent, who located north and west, leaving the less desirable east side for the working class. Which was not without much consequence. 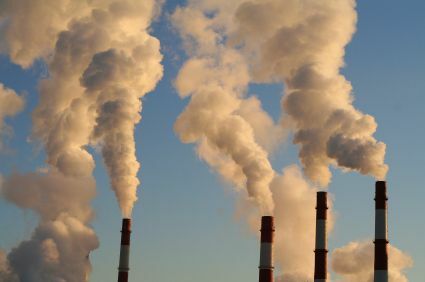 With the entire east side downwind from most of the city's industry from the 1860s through the 1980s, neighbourhoods spanning as far east as The Beach have long had pollution concerns. Back in the 1970s, children living in South Riverdale were discovered to have high levels of lead in their blood. One firm, a lead smeltering factory on Eastern Avenue called the Canada Metal Company was identified as the main culprit. It belched poisonous emissions across the east end for decades. To remedy the problem, over 1000 houses and three schools in South Riverdale underwent a massive soil remediation program. Click here for community advocate Laura Jone's documentation of her, and her neighbourhood's efforts to combat and remedy lead soil contamination. Pollution is a significant reason why, historically, the east side of Toronto has been less expensive than the west. Have you noticed how the bulk of our social housing (Regent and Moss Park, plus the blocks north of Queen east of Broadview and off Jones north of Gerrard) is located on the east side of downtown? This is because, home to the working class, the properties housing them were both smaller and constructed with less expensive materials. In fact, in South Cabbagetown (where Regent and Moss Park now stand), the original housing dating from the 1840s to 1880s was typically constructed of stacked stone foundations, frame construction, and tar paper siding. Even though the size of the dwellings were small, the size of most households (which often included lodgers) were quite large (predominantly Irish Catholic immigrants during that time), resulting in greater wear and tear on structures which were never built with longevity in mind. Given the wages of the working class were abysmal, the rent a landlord could charge wasn't always sufficiently profitable enough to keep the property presentable. Or maybe they just didn't care. For those who owned their homes, minimal wages didn't always leave enough discretionary income to adequately maintain their properties. Although all neighbourhoods, and the dwellings within them, have their own life cycles, it's feasible that as a location's housing stock becomes forlorn the byproduct, is that it fuels an area's demise. 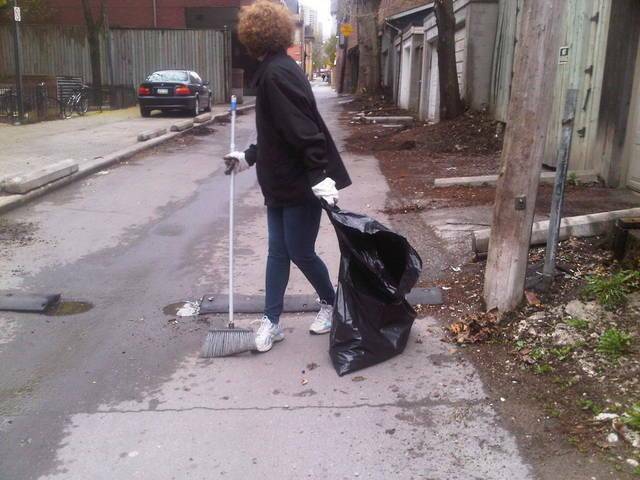 This was part of South Cabbagetown's circumstance. By the end of the First World War the area, and its 75 year old structures, had degenerated into what was considered "an impoverished slum". By the end of the Second World War, the City of Toronto, apparently with the endorsement of area residents, decided to raze Cabbagetown and rebuild from scratch. In its place went Regent Park, a modern 'garden city' with buildings placed in a 'pastoral' setting. What proponents didn't know at the time was that this social reform solution, both in its design and in its implementation, would be a failure of epic proportions. 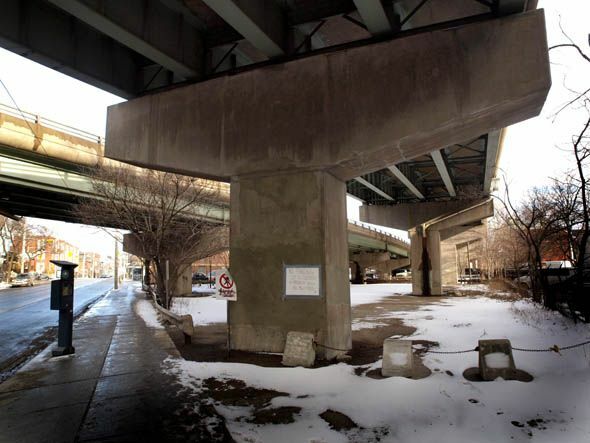 The placeless buildings - constructed without retail amenities or even casual opportunities for social engagement - took people off the street, leaving residents and passersby feeling unsafe and vulnerable. Concentrating - and ostracizing - the poor to these barren built islands exacerbated social dis-ease, including gangs, drugs and prostitution. 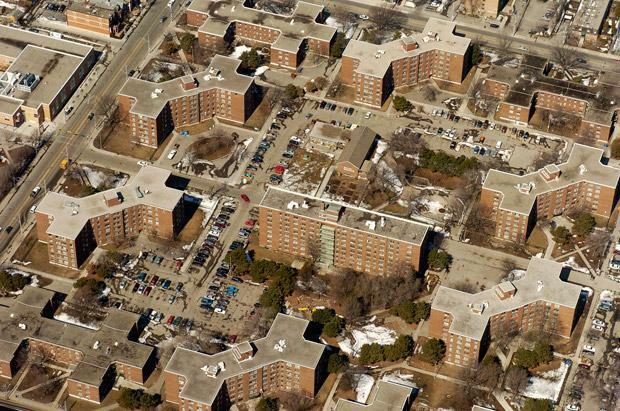 Fast forward to the 2000s and Regent Park was again being razed and rebuilt from scratch. Embracing new approaches to city-building, this time urban designers and community building experts believe they've got it right. Along with restoring vehicular traffic on the area's original street grid, ground level townhomes fronting the roads create more 'eyes on the street', thereby improving safety and increasing greater opportunities for community interaction. While large point towers have replaced the clusters of mid-density housing, their placement is set back and staggered which helps combat wind tunnels and excessive shadowing on the street. Most importantly, whereas the former Regent Park was exclusively subsidized housing, the new community is a mix of social, mixed and market housing. The ideology is that a community comprised of different socio-economic groups potentially breaks the cycle of poverty endemic to ghettos, gives the subsidized population more exposure (and presumably inspiration and motivation) to integrate with the society at large, and fosters greater social harmony and acceptance between different groups. Another factor for lower prices on the east side has to do with the size, type and homogeneity of properties. The neighbourhood of South Riverdale was originally constructed in the late 1880s thru 1910s to accommodate the working class, most whom were recent Irish, English and Scottish immigrants. 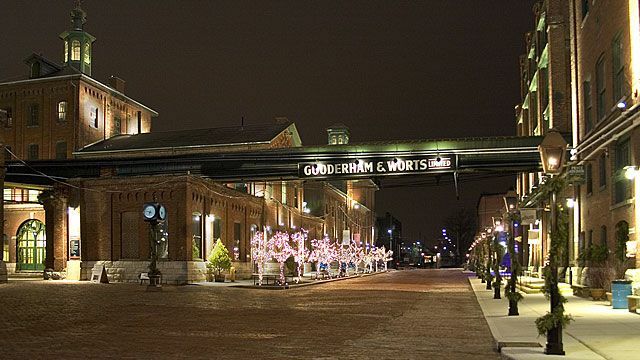 These residents worked nearby in the rail yards, the distillery and the industrial areas located on Carlaw, Eastern and south along the port lands by Lake Ontario. The housing stock was predominantly small row and semi-detached frame Victorian dwellings with brick fronts (the working class couldn't afford an all-brick house), high ceilings with plaster moldings, stained glass windows, slate roofs and ornamental fretwork. As the population grew, the city expanded east from 1900 to the 1940s into Leslieville. Here, too, the housing stock remained modest with affordable working class row, semi and some detached dwellings, though changes in construction practices and architectural styles gave it a different appearance. Whereas small-scale house builders constructed only a few properties at time prior to 1900, thereafter whole streets were built at one time by developers who embraced larger more efficient scales of economy. Furthermore, mass produced building components like standardized windows, concrete block foundations, and asphalt shingles streamlined the construction process. And, as the style and fashion of housing evolved, domestic architecture lost the embellishment and ornamentation of its Victorian predecessor as advances in building technologies like central heating systems and kitchen appliances spawned less-adorned more-modern 'machine for living' habitats. Having small lots, modest structures, and standardized materials, property values have typically cost less on the east side. Although the west side also has its share of similar housing specifically built for the working class, there are streets and neighbourhoods which accommodated other social stratas. For example, Beverley Street (where the Art Gallery Of Ontario is located), Palmerston Boulevard, Crawford Street and Beaconsfield Avenue were affluent merchant class enclaves, ringed by The Annex, Dufferin Grove, Parkdale (in its day) and High Park. Because the geography of the Don Valley River served as a natural obstacle to urban growth, the west side expanded first and farther based on the housing needs of all markets, resulting in an impressive range of domestic architecture built from 1860 thru the 1920s. Except for Jarvis and Sherbourne Streets (originally extremely affluent), Prime Cabbagetown (also block busted in part by St James Town in the 1960s), Playter Estates and sections of Prime Riverdale, most east side land (specifically east of the Don) were cheaply developed to house the working class. Whereas the west side organically evolved over decades into a diverse urban fabric, larger areas of the east side rapidly developed into a domestic landscape that, on completion, was visually plain and economically homogeneous (albeit culturally vibrant with the life cycles of Greektown, Chinatown and Little India). As long as the economic homogeneity continued to perpetuate, the value of property would be hindered. It wouldn't be until gentrification took a firm hold of the east side with more middle class buyers shaping the social makeup that the east side would change, causing property values to rise. I have an intimate understanding of the process of gentrification. 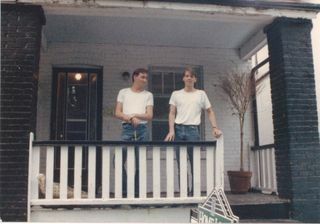 Back in the 1980s, I made my first venture into real estate by purchasing a tired two bedroom semi on South RIverdale's De Grassi Street for $87,000. All of South Riverdale, to me, felt bleak back then. There was an air of forlornness on Queen East with its vacant storefronts and discount shops and, on the residential streets, only a handful of houses showed signs of pride, sporting a fresh lick of paint or some new windows, while the rest of the housing stock looked desperately sad. A lot of front porches had broken couches with bleary eyed denizens drinking beer and smoking cigarettes. These were often the subsidized dwellings owned by the Toronto Housing Corporation, whose residents appeared broken. Whereas the retired Anglophile working class lacked the financial resources to do anything but the most essential property maintenance, they did invest their time into the public streetscape. In 1986, when I conducted my Urban Studies Thesis on 'Gentrification In South Riverdale' - funded by the Ministry of Municipal Affairs - I discovered the Chinese home owners, who were a nodal ethnic concentration living in proximity to the Broadview and Gerrard Chinatown, considered housing to be practical functional shelter and less about esthetic investment. As a highly stylized housing conceptualist in the making, I was astonished until one resident explained "If taping a plastic sheet over your broken window sufficiently stops it from leaking when it rains, then why would you need to replace the entire piece of glass?". They made a good point, though it contrasted with my own point of view as one of the early adopters. As a 'White painter', newly arrived homeowners like me invested our capital with the aim of upgrading our houses to build equity. Predominantly first time buyers with extremely limited budgets, our upgrades tended to be 'do-it-yourself' endeavors with a more creative flair. In fact, the term 'white painter' finds its roots in simple fixes. Because these Buyers, like myself, couldn't afford to sandblast our brick exteriors, we instead chose the more economical route of painting the facades of our houses white. The movement of the middle class into formerly working class neighbourhoods is - for better and worse - an integral part of urban centre rejuvenation. The extremely transitional, highly transient South Riverdale I experienced twenty-five years ago is no longer. While the gentrification process began over three decades ago, it's only been during the past ten years that South Riverdale and Leslieville has become a scorching hot destination coveted for its cool factor, entrepreneurial spirit, and stylish urban housing. Part of this has to do with the redevelopment that has occurred within South Riverdale and Leslieville. 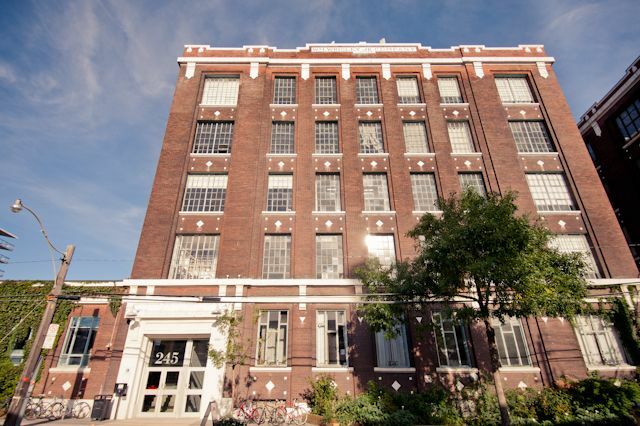 The conversion of all those factories on Carlaw into loft condominiums, plus the new development on Broadview Avenue and Queen Street East, has created new housing types for a broader mix of residents, all whom (will) support the village shopping amenities in the neighbourhood. But it's been at the expense of the working poor. As more affluent professionals have made the east side their home, the more it has attracted other like-minded peoples pushing property values up. There will soon be a sufficient density to make this section of the city a destination unto its own. In fact, it's already happened. Combine that with the intensification and rejuvenation of Regent Park into a vibrant socio-economically diverse community, in tandem with the substantial development of King Street East, the former industrial brown fields of the West Don Lands with thousands of dwellings and loads of new green space, plus the spirited rebirth of the Distillery District redevelopments, and the entire east side is on its way to becoming a new urban fabric that will be highly desirable. So, 'Dear Searching', as Toronto evolves into its own under the dynamics of a greener post-industrial economy, Toronto's downtown urban landscape will be increasingly coveted, and celebrated. Count on the current discrepancy in values between the east and west disappearing. They'll simply both be expensive." At urbaneer.com. we're here to counsel Buyers and Sellers on the dynamics of Toronto's real estate market. With a multi-disciplinary education that includes a History Degree (with a forte on Toronto's development), an Urban Studies Degree (specializing in Toronto's Gentrification), and a Graduate Degree that analyzed the development process of Toronto's Loft Conversion Marketplace', we're committed to exploring all the facets that shape our local domestic landscape. Consider clicking HERE for one of urbaneer's past newsletter on Gentrification and click HERE for one on Toronto, The City of Neighbourhoods. Do you have questions? Please know we're here to help! Perhaps we might feature your question at 'Dear Urbaneer'! Danforth East Toronto - A Village in A City!